Looking through the archives of Seymour Chwast’s work does not take long to see years of anti-war work. But even with his studio work (The Pushpin Group, Inc., originally founded in 1954 as Push Pin Studios with Milton Glaser and Edward Sorel) and reputation in the design field, sometimes you still get a project so personal that you need to start a Kickstarter campaign to get it off the ground. So, to document around 5,000 wars over the past 5,000+ years, Seymour Chwast has a Kickstarter campaign to promote the book Seymour Chwast at War with War. 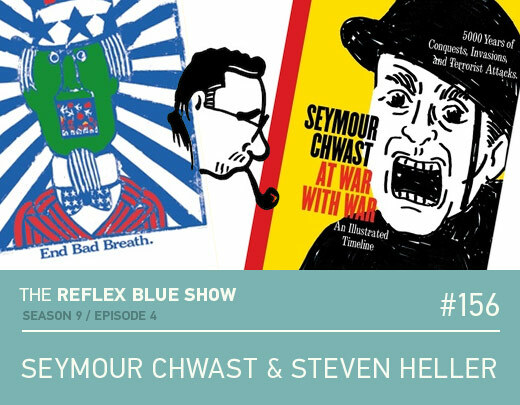 And Steven Heller (who is no stranger to writing books on design), also joins us to speak about war, Kickstarter, being at war with war, and a little bit of branding and how it’s changed over the years. And so DO has left its roots as a blog behind it forever, turning into, as a friend described it, another Communication Arts site. I’m to someone that sounds like a compliment. As far as websites go, I’m much more interested in this, which is the comic I would do if I were smarter, funnier, and still working day-in and day-out in advertising. I’m appalled at myself for not discovering Business Guys On Business Trips sooner. If you want an absolutely accurate look at my life in the industry, right up until the point I decided to work for myself, you will find it there and begin to understand. After clicking through about four or five pages I was shocked to see there was not an appalling situation in there I hadn’t suffered though. Noting a regular, weekly schedule, I added it to my bookmarks, and look forward to the next chapter with a malicious glee. Based on a true story from an alternate universe where we didn’t wait for Mr. Heller to leave before using his hotel room to the full extent of our abilities. In case you missed it last week, Justin and the fine folks at Rule 29 posted a video account of my travels to their studio on their blog. You’ll want to skip the insane close-ups of my face and general creepiness of the first few seconds and skip to the halfway point where the Intern Quiz begins. Sadly, the very first question, “Name one typeface designed by Adrian FRUTIGER,” went unrecorded, but Intern Craig’s thunderous reply “FUTURA!” might be there for all posterity’s enjoyment. The answer came with all the speed and the passion of a 16-year-old unhooking his first bra, and landed with about as much success. I’m having a great deal of frustration with the STEP 100 Reader’s Choice gallery and voting system. It is unwieldy, archaic, and blatantly favors those designs on the first page. I plan to conquer it today, and will report my findings soon.